Why does a gender pay gap still persist? Much of the gap has been explained by measurable factors such as educational attainment, occupational segregation and work experience. The narrowing of the gap is attributable in large part to gains women have made in each of these dimensions. But other factors that are difficult to measure, including gender discrimination, may contribute to the ongoing wage discrepancy. In a 2017 Pew Research Center survey, about four-in-ten working women (42%) said they have experienced gender discrimination at work, compared with about two-in-ten men (22%) who said the same. One of the most commonly reported forms of discrimination focused on earnings inequality. One-in-four employed women said they have earned less than a man who was doing the same job; just 5% of men said they have earned less than a woman doing the same job. Both men and women see inequalities in the workplace: In a 2014 Pew Research Center survey, 77% of women and 63% of men said this country needs to continue making changes to give men and women equality in the workplace. Family caregiving responsibilities, particularly motherhood, can lead to interruptions in career paths for women and can have an impact on long-term earnings. In a 2013 survey, women were more likely than men to say they had taken breaks from their careers to care for their family. Roughly four-in-ten mothers said that at some point in their work life they had taken a significant amount of time off (39%) or reduced their work hours (42%) to care for a child or other family member. Roughly a quarter (27%) said they had quit work altogether to take care of these familial responsibilities. Fewer men said the same. For example, just 24% of fathers said they had taken a significant amount of time off to care for a child or other family member. Our 2016 survey of workers who have taken parental, family or medical leave in the past two years found that mothers typically take more time off than fathers after birth or adoption. The median length of leave among mothers after the birth or adoption of their child was 11 weeks, compared with one week for fathers. About half (47%) of mothers who took time off from work in the past two years after birth or adoption took off 12 weeks or more. 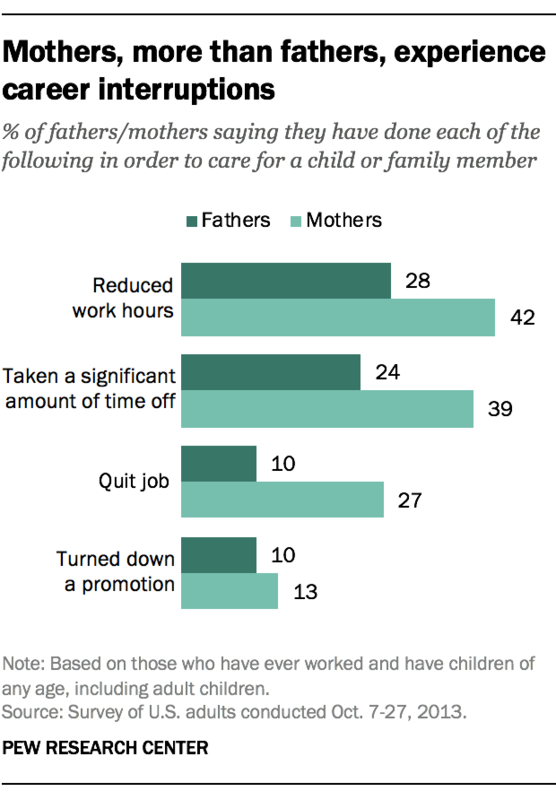 Mothers were also nearly twice as likely as fathers to say taking time off had a negative impact on their job or career. Among those who took leave from work in the past two years following the birth or adoption of their child, 25% of women said this had a negative impact at work, compared with 13% of men. Even though women have increased their presence in higher-paying jobs traditionally dominated by men, such as professional and managerial positions, women as a whole continue to be overrepresented in lower-paying occupations. This may also contribute to gender differences in pay. Note: This is an update of a post originally published April 8, 2014.